Here is the list of Best Free EML Viewer Software for Windows. These free software will help you view single and view multiple EML files. You can view EML file details here as well, like: Date, Time, Subject, To, From, etc. These software also let you view EML Attachment files. These free EML Viewers in this list let you view EML files without help of any mail viewer, like: Outlook. 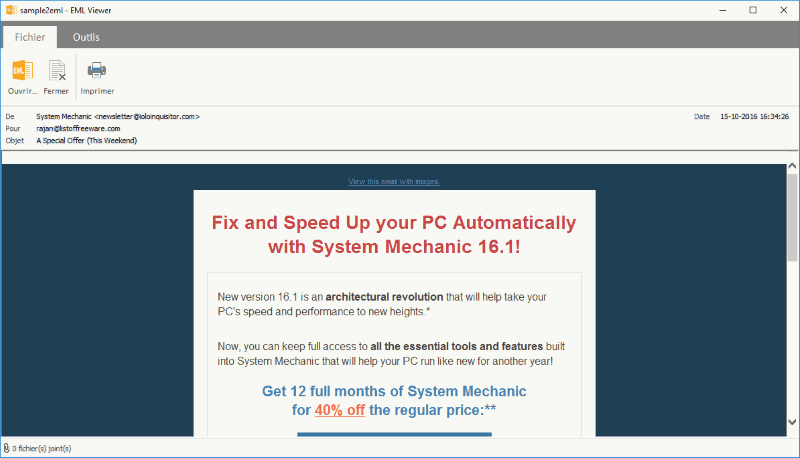 While most of these free software to view EML files will let you view Email messages along with their details, some of them may even let you open their attachments in a separate window. Some of these let you view the original format of the Email messages, while some of these EML viewers let you view EML as Text, View EML as HTML, or as Source. You can even export EML to Text and EML to HTML with some of these free EML viewing software. Just go through this list of best free EML viewer software to know more about them and the options they provide. You will also get to know How to open EML files with the listed freeware. In this list, the EML Viewer I prefer most is BitRecover EML Viewer, as it lets me view my EML files easily with detailed information. I was able to get all the MIME (TXT/HTML) information of EML files. The UI of this freeware is very user friendly and I was able to understand and access its options quite easily. You can also check out the list of Best Free Email Clients, Email Marketing Software, and OBJ Viewer Software. BitRecover EML Viewer is a free and simple EML file viewer software. You can easily open and view small and large EML files, along with its attachments and related information with this freeware. Its interface features an in-built viewer where you can view EML with its attachments. You can get all the MIME information of an EML file with much accuracy in formatting and metadata. It lets you load an EML folder and its EML files will be displayed in a list at the left side of the interface; however, you can view only a single file at a time. EML files are displayed as a list at the right side of the interface and from here, you can view information of an EML file, such as: DATA, From, To, and Subject. If you double click on an EML file in the list, it opens up the content of the mail. Specific Date (Start and End dates). This EML Viewer freeware cannot open the attachment(s) of an EML file, but only displays that attachment is available. You can always open the attachment(s) externally. It is a free version, and does not lets you save the contents of a mail. 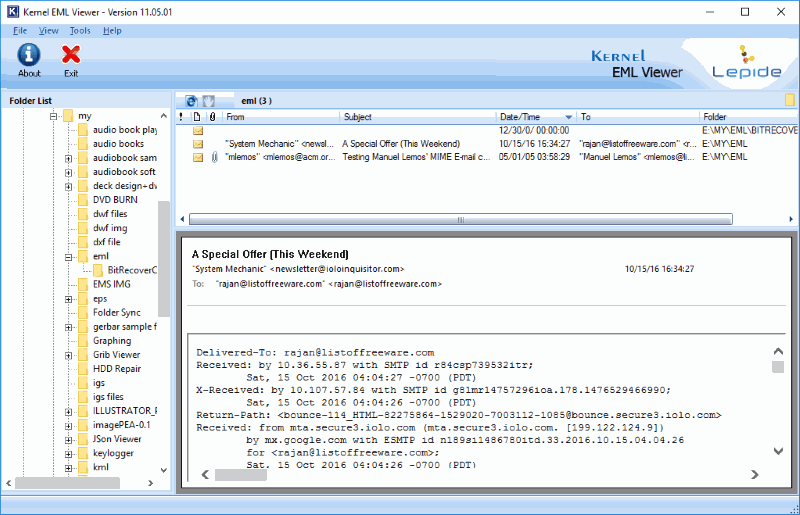 Kernel EML Viewer is a free EML viewer software, which you can use to view EML files on your PC. It has a very simple but well organised interface, where you can open and view multiple EML files from a folder at a time. You can select any folder and it automatically fetches and adds all EML files in its list. In this list, you can view Date, Time, From, To, Subject of the respective EML files, along with their attachments. Simply select a file to view its content in the area right below the EML file list. Let me tell you that, the data for an EML file will be available in Text format only. You can also view HTML tags used in EML files. One point that I would like to bring to your notice is that, although it displays the contents in Text format, you cannot edit or modify it. This freeware, however lets you Save EML file, and for this, you just have to right click on a particular file to access Save option. You can even convert EML file as HTML by clicking on the Internet Explorer icon, displayed just above the EML file list. For me, this free EML Viewer software was a satisfactory one. I got a simple view of my EML files with much ease. You too can use this freeware to view as well as save EML files along with their attachments. EML Viewer is another free viewer software which is dedicated to EML file viewing task. You can use this free EML Viewer to open and view EML files of any size along with its attachments. Although the interface of this freeware is simple but by default, its options are displayed in French, which can be confusing for any unknown user. You can always change the language from its Preference option. Once you have changed the language to English, it will be quite easy for you to use this freeware to open and view EML files. You just have to click Open option to browse and select an EML file to view it. The EML file will be displayed on the interface with its information in terms of: To, From, Date and Subject. 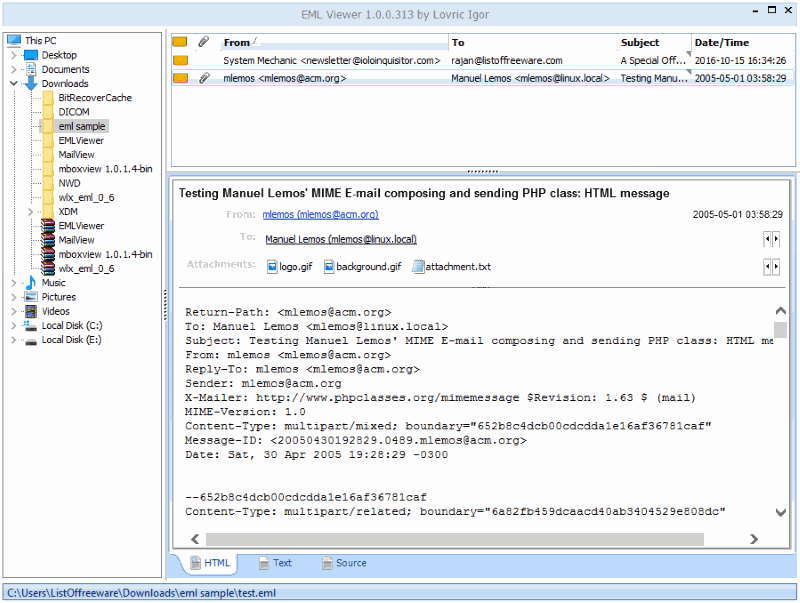 You can view email message of EML file in the large area of the interface. Its attachment(s) will be displayed at the bottom and can be opened with a double click. You can always scroll down with the scroll bar to read the whole content if EML file is a large one in size. Apart from letting you view EML file, this freeware also features some Tools, which you can use to Export your EML files as HTML and TXT. You can also view source code of file with Source option under Tools menu. This freeware also supports Print option, in case a print out of EML file is needed. I think this EML Viewer is one good software that you can use to view an EML file, although you will face a little difficulty with its French interface display. EML Viewer is yet another free and simple EML file viewer, which is specifically built to let you view EML files easily. It has a well organised interface which displays folders, list of EML files and Email messages in separate fields. At the left side of the interface, all the directories of your PC will be displayed in a Tree view. You can easily select any folder containing EML files from there and they will be automatically added in the list. Added EML files will displayed with their Date/Time, To, From, and Subject information. To view email message of an EML file, all you have to do is click on it. It will be displayed in the field just below the EML file list. You can also get HTML, Text as well as Source of EML file and for this, you just have to click on its respective option at the bottom of the interface. You can also view the attachments of an EML file in a new window by double clicking on it. For me EML viewer proved to be good EML file Viewer software. Its well organised interface really helped to view my multiple EML files along with their attachments. Awesome thing is that it let me view HTML, Text and Source of EML files as well. This is definitely one of the good EML Viewer software that you can use to view you EML files. Tci Eml Viewer is yet another free EML Viewer software that you can use to view EML files. With this freeware you can easily add multiple EML files in a list and view them one at a time. This freeware lets you open and view EML files in a typical manner. To add an EML file it has a special field named Drop Zone, where you have to drag and drop your EML file. All the files that you have added will be displayed as a list below the Drop Zone field. You can view details of EML files in this list in terms of From, To, Sent and Subject. You can clear this list if you want to add a new list of EML files with Clear List button at the bottom right of the interface. To view an EML file, all you have to do is double click on a particular file from the list. The EML file will be opened in new window from where you can view the Email message and attachments, but let me inform you that, you cannot open attachments with this free EML Viewer software. Although this freeware displays a Menu bar, it is a disappointment that it doesn’t works. You will not be able to use it for any purpose. I will say, if there is no other good EML Viewer software available, this freeware can be tried just to view EML files. 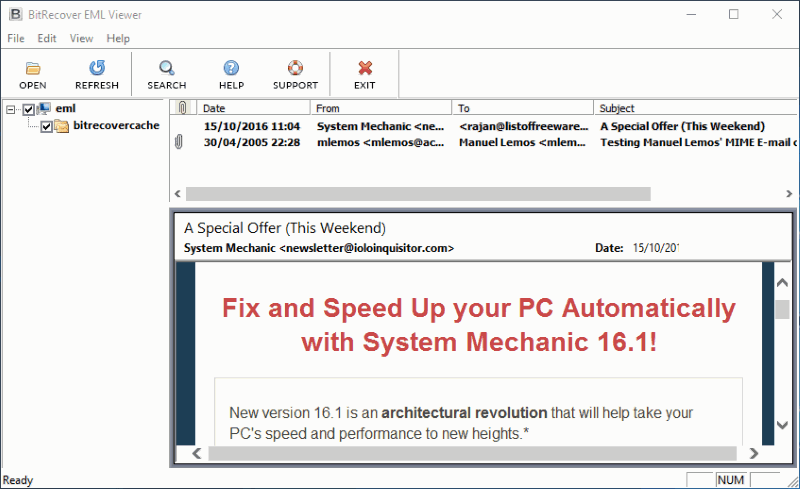 MiTec Mail Viewer is another good EML Viewer software which will help you to view EML files easily. 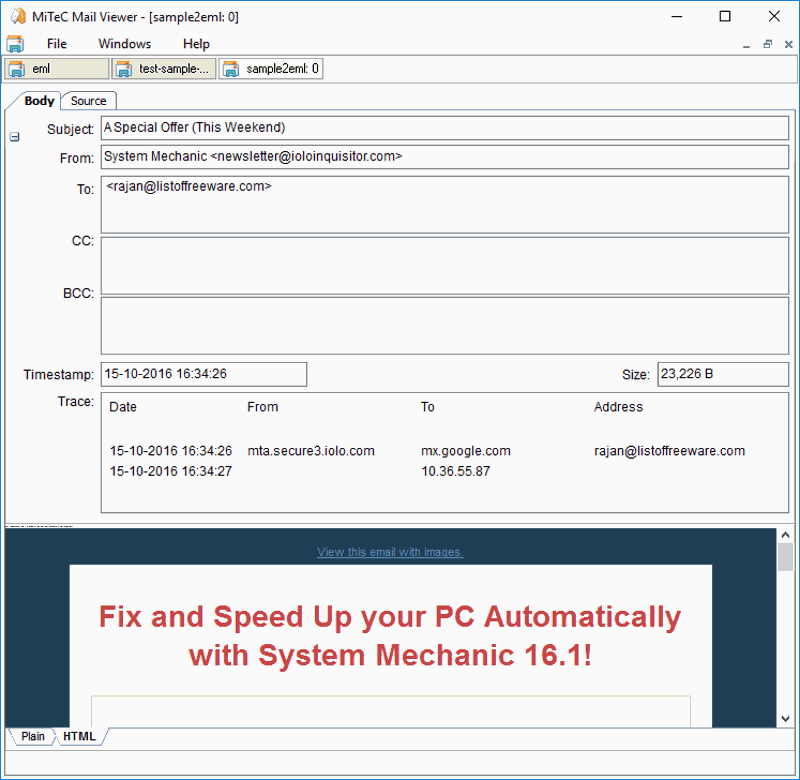 This free software lets you open EML files from Outlook, a folder on your PC, Mozilla Thunderbird Message Database, and Single EML file. You just have to select any of these options to open and view EML file from them. As soon as you open an EML file, it will display message body as well as its source along with body detail. You can also view various information of an EML file, such as: Subject, From, To, BCC, CC, Time, and Size. 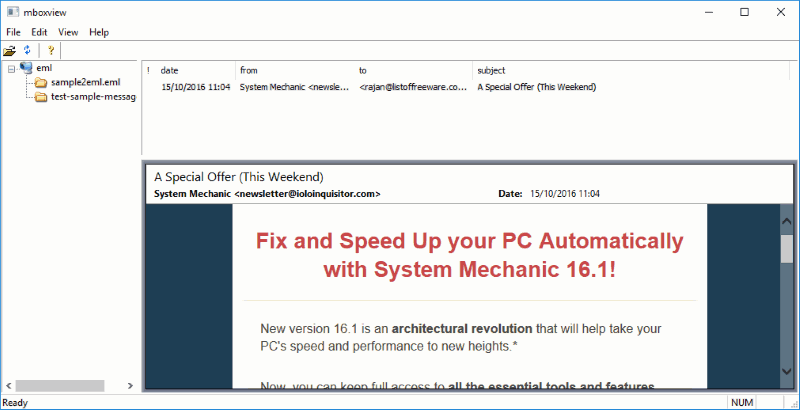 It even displays Plain as well as HTML view of the email message, which you can easily toggle and view. There is one unique feature that this free EML Viewer supports is that you can view multiple EML files at the same time by opening them in different windows. You can even Tile and Cascade the windows as per your choice. I think this freeware is a good choice among other EML Viewer software. Its support for Windows options lets you load multiple EML files and view them at the same time along with their attachments and other information. I will say, this is the EML Viewer that you can surely use to view your EML files. Free EML File Viewer as it goes by this name only, is an EML Viewer software which you can use for free. This is one good viewer software with which you add multiple EML files and view them individually. It has a simple and well organised interface and gives ease of use. At the left side of the interface a Tree view of your PC’s directory is displayed from where you can select the folder containing EML files. After you have selected the folder, this freeware automatically adds its EML files to the list. From the list of EML files, you can get information about Date, From, Subject, To and Sent of an EML File. You can view the email message of EML file by double clicking on it, which will be displayed at the bottom of EML file list. The field which shows you the Email message also displays some other features. 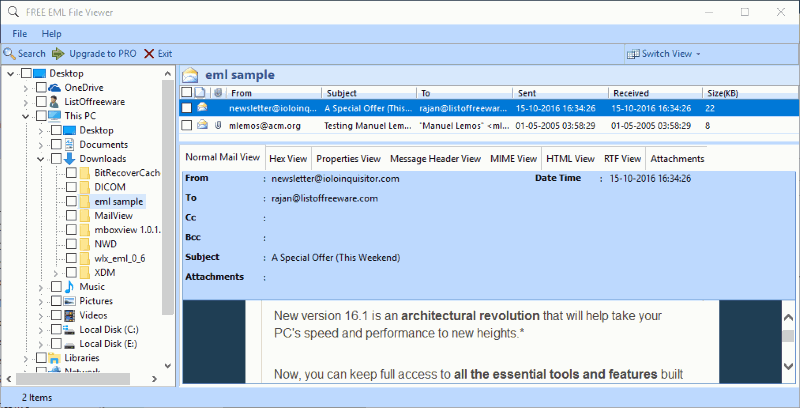 With these features you can get Normal Mail View, Hex View, Properties View, Message header View, MIME View, HTML View, RTF View and Attachments of an EML file. For me, this was a great free software to view EML files. It not only lets me load and view my EML files one by one but also provided me various different view of Email messages. This surely is the freeware that I would like to recommend you to use for EML Viewing. Windows MBox Viewer is a free EML Viewer software and it lets you view EML files along with their attachments easily. It has a very simple interface and is organised in such a way that it becomes quite easy for you to understand and use it. It features a simple Menu bar on its interface with which you can open and view EML files. You can view multiple EML files individually, which are displayed at left panel of the interface. You can click on an EML Folder on the left and its content EML files will be added in a list at the right side of the interface. This list will show the Date, From, To and Subject information of added EML files. By clicking on any EML file in this list, you can view its email message along with attachments just below the interface. You can even open attachments with a double click. This freeware also lets you search for a particular Header or full RAW message in an EML file. For this, you just have to access the Find option under Edit menu and enter the text that you want to search. Although you cannot save an EML file with this free EML Viewer, still you can use this freeware to view EML files with their attachments.